If you own a plaster swimming pool and it's seen better days, it may be time to consider painting. Not only is it a cheaper choice than re-plastering, paint can help protect plaster from having a mottled, pitted appearance, prevent rough surfaces that can scrape skin on swimmers, and keep stains from forming which require corrosive acid treatments to remove. Take time to carefully prepare the pool surface after it's been drained and before you begin painting. 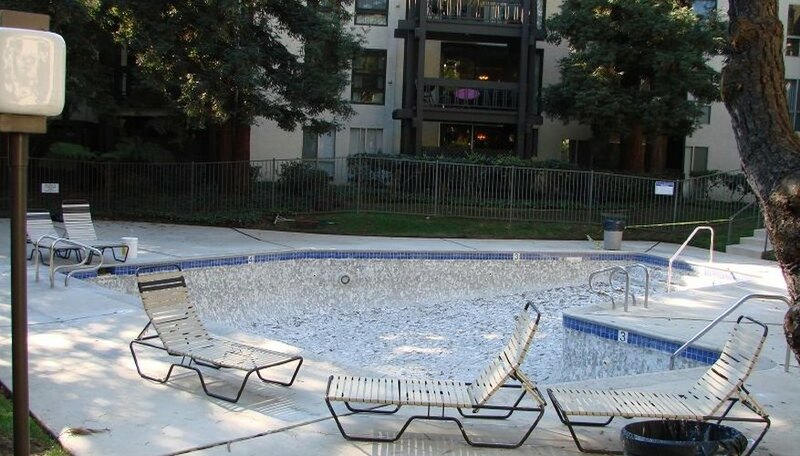 Most swimming pool paint failures occur due to sloppy surface preparation. Make sure all masonry surfaces are completely clean by using a 15 to 20 percent solution of muriatic acid. Acids can cause toxic fumes, so make sure there is adequate ventilation and use a safety mask and gloves. Allow to completely dry, then wash the walls with tri-sodium phosphate (TSP) to remove any remaining oil and dirt. Next, repair all cracks, holes and surface breaks with a rich grout or non-shrink patching mixture. Finally, sweep the pool thoroughly to remove all loose dust, using a heavy-duty vacuum. If your pool is new, it's generally recommended you allow the plaster to age for at least two to three months before painting. Avoid temperature extremes when choosing a time to paint your pool, which means probably not painting during the summer and winter months in cooler climates. Also, schedule the painting during drier, less humid weather and look for a period when the forecast calls for five to seven days of clear skies. If it does rain during this time, remove standing water from the pool and use a leaf blower for quick drying. The best time of day to paint is mid-morning when the temperature is between 40 and 90 degrees and the sun isn't at full strength (shade is preferred). If necessary, consider renting a party tent to cover the pool while you paint. Allow enough drying time, usually 24 hours, between each coat of paint. After your final coat, the painted surfaces should cure for seven to 10 days before you refill the pool with water; filling the pool too soon can cause blistering and peeling. Rubber-based swimming pool paints should last three to five years, and epoxy paints should last up to seven years.